Now, when most people think about space, they imagine it to be a total vacuum. Completely empty of anything whatsoever. The thing is, that’s not quite true. Those spaces between the stars aren’t quite as empty as you might think. In fact, space is rather clumpy. Clouds of gas and dust stir, turbulent in the darkness. Patches just a few astronomical units in size. Vast by our standards, but on the scale of an entire galaxy, tiny. This is the so-called “small scale structure” of the interstellar medium. These patches drift between the stars, clumping together with other patches of material or being eroded away by ultraviolet light. The ultraviolet drives active photochemistry. Strange molecules react and evolve, some of them sticking to the surfaces of dust grains. Tenuous chemical bonds are formed, which would be destroyed instantly at the sort of pressures found here on Earth. Not just molecules are found in these regions, but atoms and ions. Precisely what’s happening in these regions is still being discovered. They can be studied by looking at emission from neutral hydrogen at radio frequencies, or by looking for absorption lines in starlight. Some, known affectionately as “infrared cirrus,” emit infrared light too. 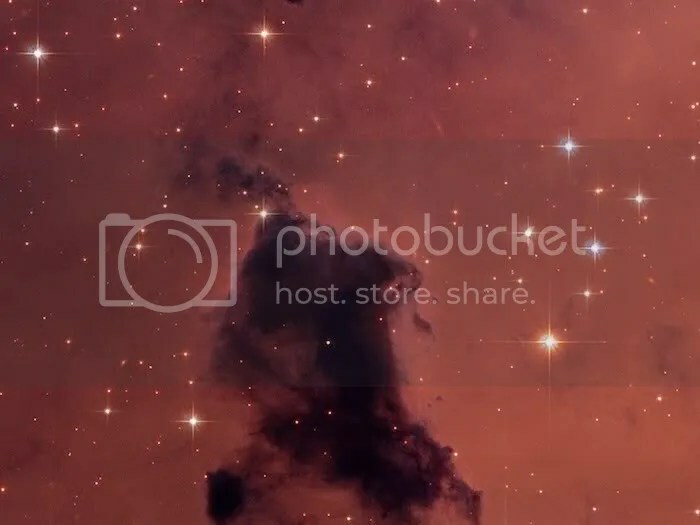 The image below shows a Bok globule (somewhere in the NGC 281 star forming region). A small clump of dense gas and dust, slowly collapsing into stars. It’s illuminated from behind by red light; light from hydrogen atoms being ionised by newly born stars. Take a look at all of those patches around it. All of the clumps and fine filaments. Here and there, you can see stars whose light is shining through the globule. Their light appears redder than the others, because of the blue wavelengths of light being absorbed or scattered, unable to penetrate through the cloud. The process is known as extinction, and it’s extremely useful in studying these clouds. Looking at the starlight that’s passed through these interstellar clouds, you can see all of the lines in the spectrum where the starlight’s being absorbed by atoms or molecules. And not all of those absorptions can be easily identified. That’s the hard part. And when I say the hard part, what I really mean is the fun part! Perhaps the one thing that still amazes me the most is — that globule of gas and dust. You can see it. It’s obviously there, dark against the background, blocking out starlight. But that cloud is still essentially vacuum by terrestrial standards. The highest vacuum ever created on planet Earth is still orders of magnitude denser than that cloud which you see in the image above. Chemical reactions in these clouds occur on timescales of years and individual molecules can travel for miles without encountering even as much as a stray hydrogen atom. That Bok globule may be 50 times the mass of the Sun. To us though, it’s mostly made of nothing at all. Look again at that image, and take a moment to think about that. Image: Bok Globule in NGC 281 – NASA, ESA, The Hubble Heritage Team STScI/AURA (P. McCullough) – There’s a fuller version of the image here! This entry was posted in astronomy, Imported from Livejournal and tagged astrochemistry, astronomical images, spectroscopy. Bookmark the permalink.